I’m overwhelmed with the amount of incredible artwork coming out of the Obey camp in the past two weeks. 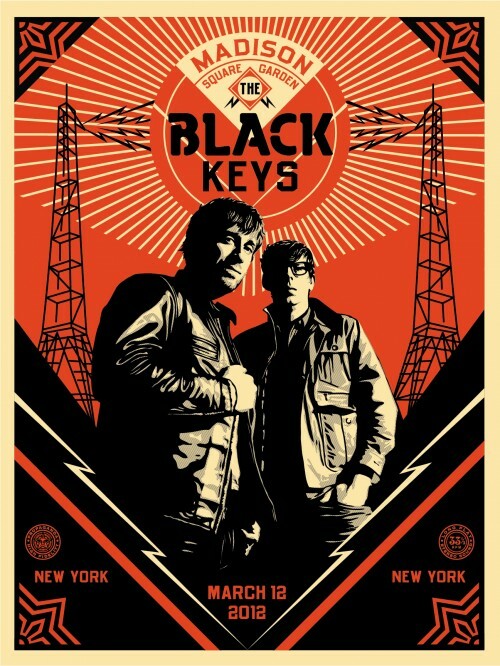 For the third week in a row pop-artist Shepard Fairey is releaseing a killer series of music inspired prints that are a much larger format that his usual style. Over the past week he has released 6 massive images that have sold out in “record” time (no pun intended, really), getting one has been strictly luck I’m sure. This weeks release of three images is no less impressive and in my opinion probably the best thus far. I would be bummed personally if I bought any of the prints within the last two weeks since these trump those in style and impact. These prints are expensive, around $500 per print and come in a limited edition of 50 (signed and hand numbered). I wish I had the scratch to keep up and grab some each week, but looks like the wife has kyboshed any such impulsive urges until I get the remainder of my prints framed. A bedroom of print tubes I’m sure is the reasoning, and I can’t argue my way out of that. If you like this print check out the others at www.obeygiant.com the release times of his prints are always random (I’ve found anywhere between 2:00 and 5:00 EST to be the most common), remember, Obey is on the West Coast time. The release date for these prints is todayMay 5th, good luck! As you know we here at Hi Fi Central are avid art collectors, specifically in music related prints. Pop propaganda artist Shepard Fairey is realeasing a very cool series of prints today at a random time. The prints are larger than his usual weekly releases and the price tag as well, $500 per print, yikes! Granted, these prints are limited to only an edition size of 40 and are very striking. There are three different prints being offered, but the one featured is my favorite. 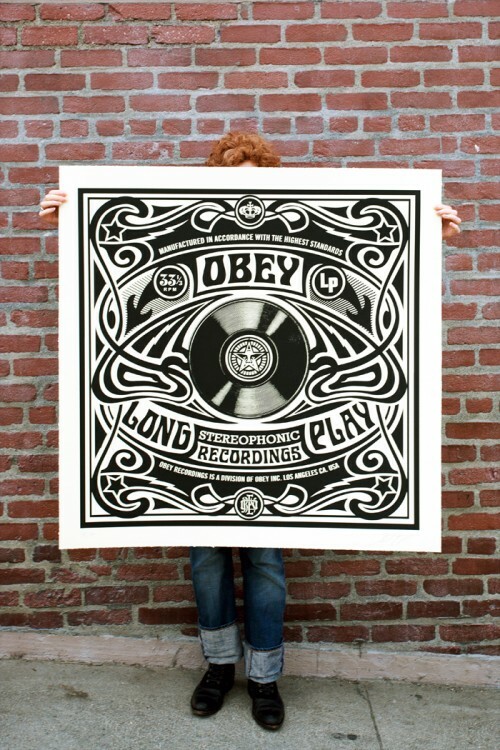 Obey Giant is located on the West Coast so if you live on the East Coast release times usually happen any where from 2:00 to 5:00 EST, but again, it’s always random so you never know when they will be available for sale. Fairey’s prints often sell out in minutes, even the $500 ones, so if you want them you got to be pro-active and keep hitting that refresh button and then strike! Good luck and let us know if you get one. UPDATE: ALL THREE IMAGES ARE SOLD OUT!! To see todays release and other Fairey creations, click here. 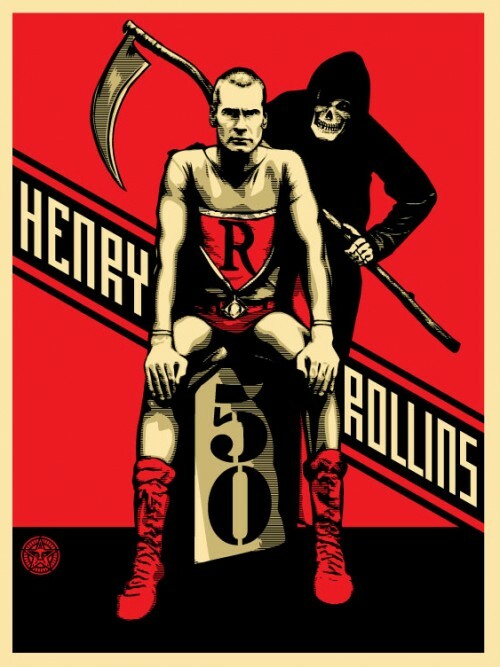 Henry Rollins Print Release Today! As you may well know from past posts, here at HiFi Central our walls are covered with many limited edition prints from artists we have featured in the past. Today there is a release of the iconic punk frontman from the band Black Flag, the one and only Henry Rollins. Artist Shepard Fairey will be releasing a print honoring Rollin’s 50th birthday this afternoon. Fairey’s release times are always at a random time of his choosing, so you need to check back to the website every hour on the hour. Historically his prints sell out in a matter of minutes, so if you want one you need to be pretty diligent at hitting the refresh button every 5 seconds. The print is in an edition of 700 and is signed and numbered by Fairey. The cost is a mere $45, so it’s a bargain for sure. Good luck and let us know if you get one! You can learn more about Shepard Fairey and also information about hopefully getting one of these prints by clicking here. As of 2 / 7 / 2011 print is officially SOLD OUT! 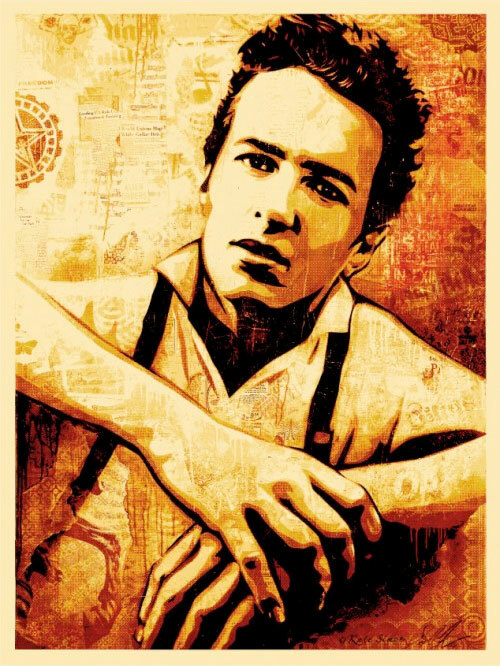 Joe Strummer Print Release today! 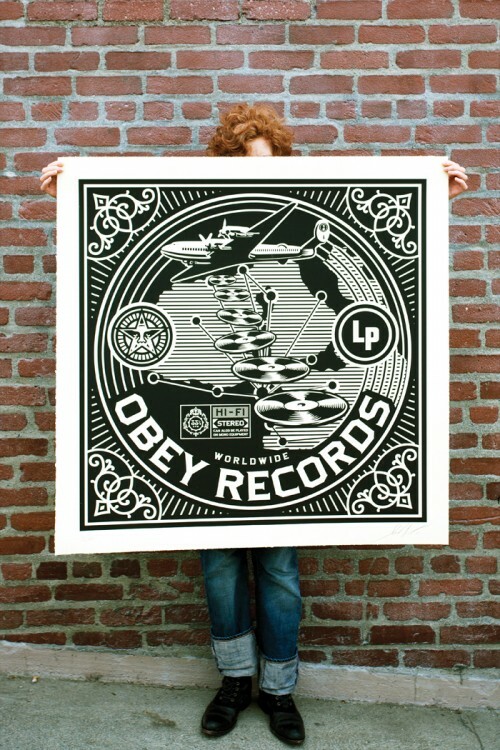 If you read my April 2010 post entitled “The Art of The Music Business” you will appreciate today’s release of a print by artist Shepard Fairey (of Obey fame). The print will be released at a random time (my experience has been between exactly 2:00 and 4:00 EST), so get on early and keep hitting the refresh button on your browser. UPDATE!!! It went up for sale at 1:00 EST so get it if you can! Often his prints sell out in minutes so you have a good chance of NOT getting one, it is a very frustrating process, however to Fairey’s credit he does make his prints available at very cheap prices, the Strummer print is $70 and is in an edition size of 450 (signed and numbered by Fairey). As with most of Shepard Fairey’s prints they skyrocket in value nearly the next day so they are a worthwhile investment and if you really appreciate art, not bad to hang on your walls if you get them professionally framed. Joe Strummer was the cornerstone the British band The Clash and this print does a nice job of paying homage to the rock icon. Hat’s off to you Shepard, nice one! 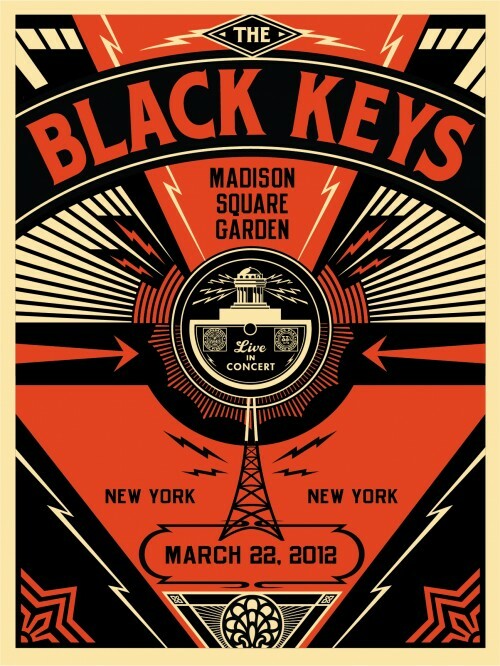 If you are interested in seeing this print and more of Shepard Fairey’s art, click here and good luck on getting one! Over the past few years my wife and I have been collecting art by artists like Phil Frost, Shepard Fairey and Dave Kinsey. Granted all three are not up and coming artists and are quite established in the contemporary art world , their art has spurred a generation of others to create and express their creativity in a myriad of mediums. Although the “rock art poster” is not a new concept, the gradual evolution has produced some very impressive and clever designs that most of the general public never get to see, or further, consider collecting as reputuble art worthy of hanging on our walls at home (other than our college dorms or first apartment with college buddies). The indie music art world actually is worth considering and now is the time to take advantage of limited edition signed artwork for a steal. The toughest part of collecting limited edition prints is first: “where to look” and second: “timing”. It is quite common these days for an artists website to crash due overwhelming response to a monthly release. These releases are often at random times, in the afternoon between 12:00 -5:00 during work hours when most of us do not have the luxury to keep hitting the “refresh page” button on our computer. Those of us who have attempted to purchase prints by Shepard Fairey or KAWS know how frustrating this process is and how disappointing when the next refreshed page reflects SOLD OUT in bold letters. It’s often the recipe for the budding collector to feel cheated and quickly become bitter about collecting all together. Luckily, there is a great resource where you can snag incredible prints at very low prices of your favorite bands or perhaps designs that you like but have never heard of the band. The website is through a record store chain in Boston called Newbury Comics. Newbury Comics is a store like no other and is a mecca for indie music lovers, toy collectors, not to mention comic books and graphic novels fresh off the press. It’s a culmination of music store, comic book store, Spencers Gifts (although not as cheezy or commercially repulsive), and clearly something unto itself that has no classification that I can figure out. Part of their website is devoted to limited edition posters; the selection is simply mind blowing. You can browse either by your favorite band or have fun as I do and check out the various prints by alphabetical order. Some prints are sold out or out of stock, however, a large amount are still available for purchase. I also like that Newbury Comics provide direct links to the artists websites, so if you want to learn more about the artist and what more they may have to offer it’s just a click away. This is how I learned about an artist named Dan McCarthy who’s artwork my wife and I avidly collect; although we collect his nature inspired prints he has done prints for Iron and Wine, Calexico, and Sonic Youth. Another fun artist is Dan Stiles, he is one of my favorites and has a very unique style about him; his prints sell out quite quickly but there are still some you can grab. Many of the prints that are offered in the Newbury Comics sites are very limited in production, some prints are limited to 25, 50 or 100, and the prices range from $40 – $125. Signed limited edition art is fun to collect and often appreciates in value rather quickly, so if you are a budding collector, have limited funds, need real artwork, and have walls that need love, consider checking into this and tell us what you think. 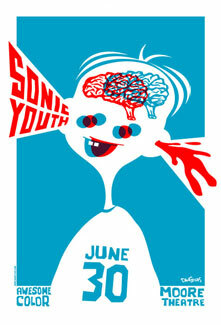 You can check out the Newbury Comics print collection by clicking here, enjoy!